Cam Newton, who had surgery to repair a partially torn rotator cuff in his right throwing shoulder in March, practices with teammates for the 1st time since the end of last season. Carolina Panthers quarterback Cam Newton dances as players warm up for practice during a training camp at Wofford College in Spartanburg, South Carolina, on July 26, 2017. 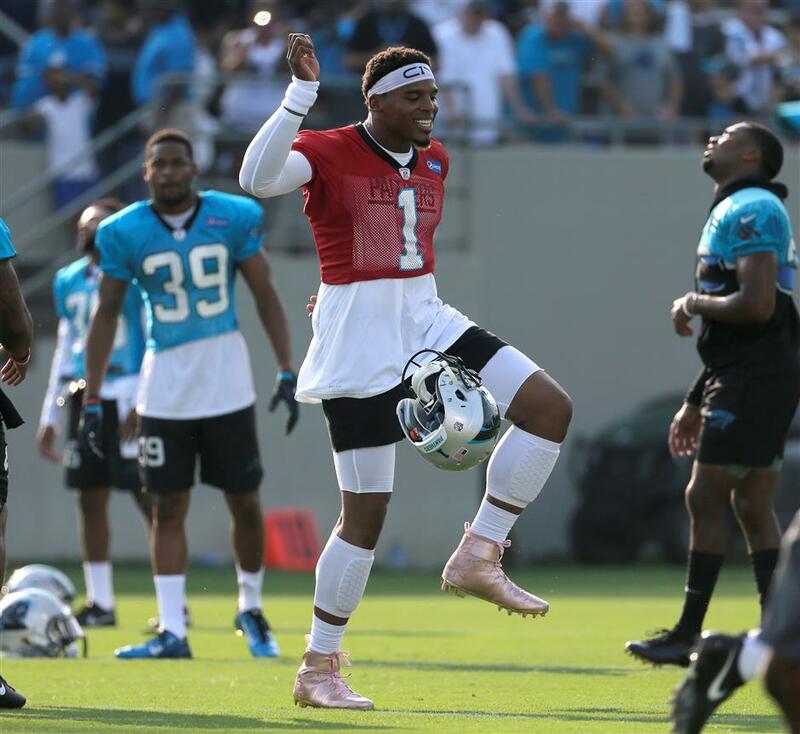 Cam Newton was back doing what he does at practice — dancing, playing up to the crowd and, most importantly, throwing passes. Newton showed no ill effects from offseason shoulder surgery as the Carolina Panthers opened training camp on Wednesday night at Wofford College in Spartanburg, South Carolina. "He was a little rusty early on and his timing was off a little bit, but it was practice one and you can see he was getting more and more comfortable back there," Rivera said. Rivera said the Panthers will keep Newton on a "pitch count", limiting his throws in practice. "It's a start," Newton said. "Everything felt good, but we have a long way to go to get where I know we can be. Tonight was just fun getting out on the grass in front of the fans and throwing it around a little bit." "He is infectious in terms of that," Rivera said. "Mentally he was pretty sharp and he did a good job of not trying to do too much," Shula said. "I think all of us are pretty pleased. ... You can tell he was eager to get back out and it's a good start." His first throw during team drills was a completion in the flat to tight end Ed Dickson, but his second pass — also intended for Dickson — was intercepted by cornerback James Bradberry who jumped the route. Newton bounced back with a 35-yard completion to Russell Shepard during 6-on-7 drills — by far the longest pass he attempted all night. "He just has to try not to do too much," Shula said. "As a coach you always want your guys to get as many reps as you can, especially at that position. We are playing catch up, not just with him but with some other guys. ... But our goal is to have him ready for the (regular season) opener." The 28-year-old quarterback injured his shoulder last December in a win over the San Diego Chargers, but finished the season. The Panthers hoped rest during the offseason would allow the shoulder to heal naturally, but when it didn't respond as well as expected he opted for surgery. He completed a career-low 52.9 percent of his passes with 19 touchdown passes and 14 interceptions. However, his offensive line struggled to protect him all season.